Shocked by indifference in Japan and U.S. government circles toward island’s interests, lawyer takes matters into her own hands. However, such official comments on Tokyo-Washington ties are misleading, believes Sayo Saruta, the director of Japanese think tank New Diplomacy Initiative. “In reality, the diplomatic channels between Japan and the U.S. are very narrow. Tie Japanese side is limited to a small number of conservatives who fail to reflect the variety of opinions held by the Japanese public,” explained Saruta in a recent interview at her Tokyo once. “On the U.S. side, there are only around a dozen people influencing the final decisions in the U.S.-Japan relationship.” Saruta, a lawyer specializing in human rights who has worked closely with Amnesty International and Human Rights Watch, had numerous opportunities to witness the flawed realities of U.S. The chair of the U.S. House subcommittee speculated that the population of Okinawa was around 2,000 (the actual number was almost 1.4 million); then he wondered whether the island even possessed a civilian airport. Japan diplomacy while based in New York and Washington between 2007 and 2012. What particularly troubled her was American decision-makers’ lack of knowledge or interest about Okinawa, the Japanese island the U.S. maintains more than 30 military bases. In 2009, Saruta met the chair of the U.S. House Subcommittee on Asia and the Pacific, the group overseeing relations with countries including Japan, to discuss military issues in Okinawa. According to Saruta, during the meeting, the chairman speculated that the population of Okinawa was probably around 2,000 (at the time the actual number was almost 1.4 million); then he wondered whether the island — a major international tourist destination — even possessed a civilian airport. Saruta says this indifference toward Okinawa was widespread among U.S. experts and the Japanese diplomatic community in Washington. Convinced that there needed to be alternative channels of communication between the U.S. and Japan, she searched for any diplomatic organizations that shared that belief. To her surprise, none existed, so she decided to found her own. Launched in 2013, New Diplomacy Initiative is a think tank that, according to Saruta, aims to input fresh voices into debate between Japan, the US. and other East Asian countries. With Saruta at its helm, the current board of directors includes TV journalist Shuntaro Torigoe, former Defense Ministry official Kyoji Yanagisawa and George Washington University professor Mike Mochizuki. In 2014, New Diplomacy organized 13 symposiums in Japan and four in the U.S. to discuss issues such as Sino-Japanese relations and Abe’s push to enable the Self-Defense Forces to come to the defense of an ally. However, New Diplomacy Initiative’s main concern remains the issue that spurred Saruta to create the think tank in the first place: Okinawa. Last year was a tumultuous one for the island as the Japanese government stepped up long-stalled efforts to build a new U.S. military facility in Henoko Bay, Nago. At sea, peace campaigners who attempted to block survey work were assaulted by the Japanese Coast Guard, while on land, elderly demonstrators were injured in scuffles the police. November saw the election of a new anti-base governor, Takeshi Onaga, and in last month’ election, all of Abe’s pro-base Lower House candidates were defeated in Okinawa’s four single-seat constituencies, But despite such overwhelming opposition, the Japanese government announced that construction on the new base would proceed as planned. 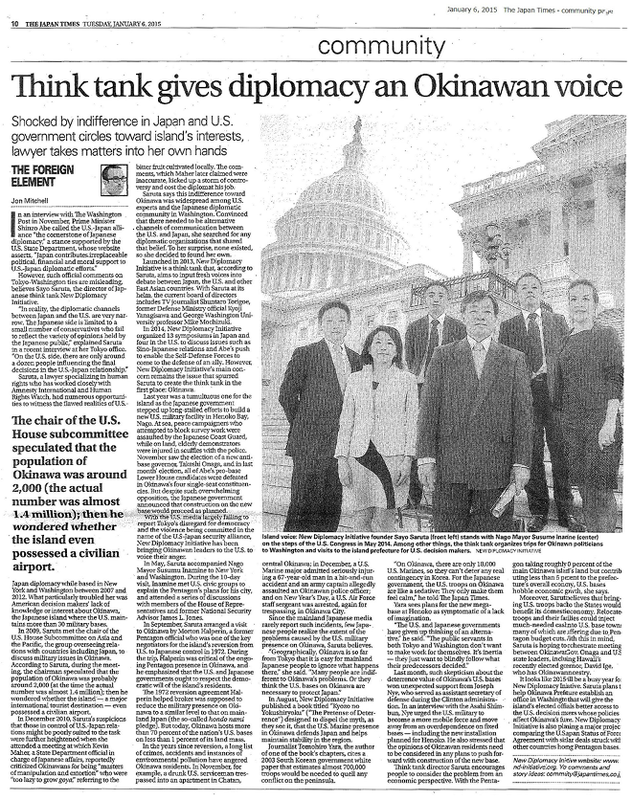 The U.S. media largely failing to report Tokyo’s disregard for democracy and the violence being committed in the name of the U.S-Japan security alliance, New Diplomacy Initiative has been bringing Okinawan leaders to the U.S. to voice their anger. In May, Saruta accompanied Nago Mayor Susumu Inamine to New York and Washington. During the 10-day visit, Inamine met U.S. civic groups to explain the Pentagon’s plans for his city, and attended a series of discussions with members of the House of Representatives and former National Security Advisor James L.Jones. In September, Saruta arranged a visit to Okinawa b Morton Halperin, a former Pentagon official who was one of the key negotiators for the island’s reversion from the U.S. to Japanese control in 1972. During the trip, Halperin was critical of the ongoing Pentagon presence in Okinawa, and he emphasized that the U.S. and Japanese governments ought to respect the democratic will of the island’s residents. The 1972 reversion agreement Halperin helped broker was supposed to reduce the military presence on Okinawa to a similar level to that on mainland Japan (the so-called hondo nami pledge). But today, Okinawa hosts more than 70 percent of the nation’s U.S. bases on less than 1 percent of its land mass. In the years since reversion, a long list of crimes, accidents, and instances of environmental pollution have angered Okinawa residents. In November, for example, a drunk U.S. serviceman trespassed into an apartment in Chatan, central Okinawa; in December, a U.S. Marine major admitted seriously injuring a 67-year-old man in a hit-and-run accident and an army captain allegedly assaulted an Okinawan police officer; and on New Year’s Day, a U.S. Air Force staff sergeant was arrested, again for trespassing, in Okinawa City. Since the Japanese media rarely report such incidents, few Japanese people realize the extent of the problems caused by the U.S. military presence on Okinawa, Saruta believes. In August, New Diplomacy Initiative published a book “Kyozo no Yokushiryoku” (“The Pretense of Deterrence”) designed to dispel the myth, as they see it, that the U.S. Marine presence in Okinawa defends Japan and helps maintain stability in the region. Journalist Tomohiro Yara, the author of one of the book’s chapters, cites a 2003 South Korean government white paper that estimates almost 700,000 troops would be needed to quell any conflict on the peninsula. “On Okinawa, there are only 18,000 U.S. Marines, so they can’t deter any real contingency in Korea. For the Japanese government, the U.S. troops on Okinawa are Like a sedative: They only make them feel calm,” he told the Japan Times. Yara sees plans for the new mega-base at Henoko as symptomatic of a lack of imagination. Last month, such skepticism about the deterrence value of Okinawa’s U.S. bases won unexpected support from Joseph Nye, who served as assistant secretary of defense during the Clinton administration. In an interview with the Asahi Shimbun, Nye urged the U.S. military to become a more mobile force and move away from an overdependence on fixed bases — including new installation planned for Henoko. He also stressed that the opinions of Okinawan residents need to be considered in any plans to push forward with construction of the new base. Think tank director Saruta encourages people to consider the problem from an economic perspective. With the Pentagon taking roughly 0 percent of the main Okinawa island’s land but contributing using less than 5 percent to the prefecture’s overall economy, U.S. bases hobble economic path, she says. Moreover, Saruta believes that bringing U.S. back to the States would benefit its domestic economy. Relocate troops and their facilities could inject much-needed cash to U.S. base towns, many of which are suffering due to, Pentagon budget cuts. With this in mind, Saruta is hoping to orchestrate meeting between Okinawa Gov. Onaga and U.S state leaders, including Hawaii’s recently elected governor, David lge, who has Okinawan ancestry. It looks like 2015ill be a busy year for New Diplomacy Initiative. Saruta plans to help Okinawa Prefecture establish an office in Washington that will give the island’s elected officials better access to the U.S. decision makers whose policies affect Okinawa’s fire. New Diplomacy Initiative is also planning a major project comparing the U.S-Japan Status of Force Agreement with similar deals struck with other counties holding Pentagon bases.